The climb starts at the small village of "El Ojuelo", where a fountain springs forth pristine, crystal clear waters. This is an ideal spot to fill the bidons, as from here, water gets pretty sparse. The road adopts an immediate incline and takes a direct route to the next small village, "El Robledo". This section is sustained, with about 7% for 1.5km, plenty enough to get the thighs and calfs warmed up for the next 11km of climbing. El Robledo marks the transition from Olive to Pine, from here the road winds up the flanks of El Yelmo through ancient pine forest, the road littered with needles and the loamy aromas of mulch and pine nuts drift along the gentle breezes. 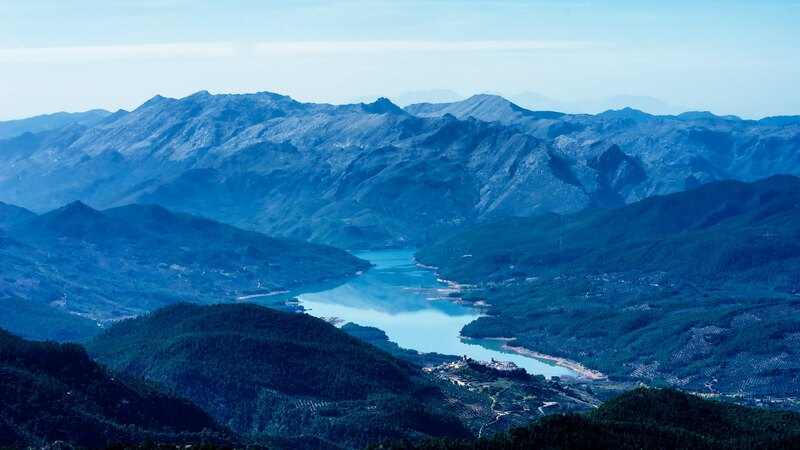 Several switchbacks ease the gradient, and offer tantalising vignettes of the fast descending valley floor and the lake of El Tranco beyond. The gradient eases as the road crests the shoulder of the ridge line, and from here, those less valiant can continue ahead to explore the hinterland of the Seguras, or descend back to the valley to either Siles or Hornos. The summit of "the Great Helm" however follows a sharp return up a somewhat uninspiring start. The road looks innocent and harmless, and indeed is so, until you round the first two corners. From here the climb is sustained, prolonged, and unforgiving. No respites, no broad switchbacks, no cheeky zones where gravity gives you some relief. Its just 4km of "up" with some nasty double digit ramps thrown in to keep you on your toes, or at least out of your saddle. The views are however, magnificent. 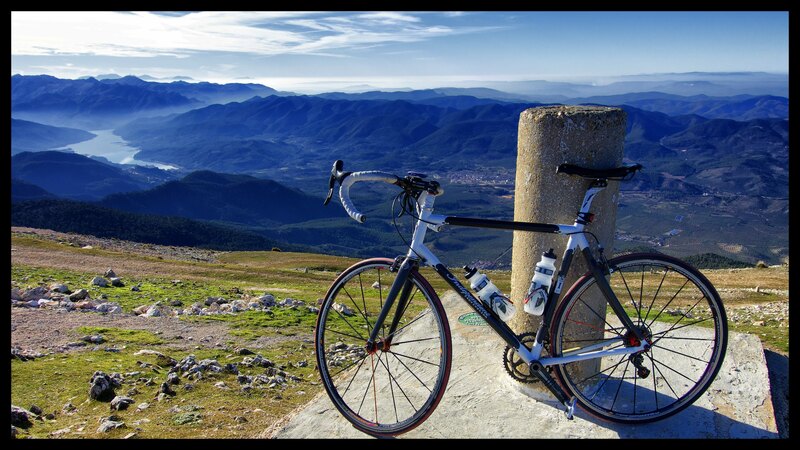 The first section rewards with views across to the west and as you cross the ridge line, youre given the chance to view the endless miles of mountains to the east, the convoluted and labyrinthine network of ravines and peaks that form the Seguras. 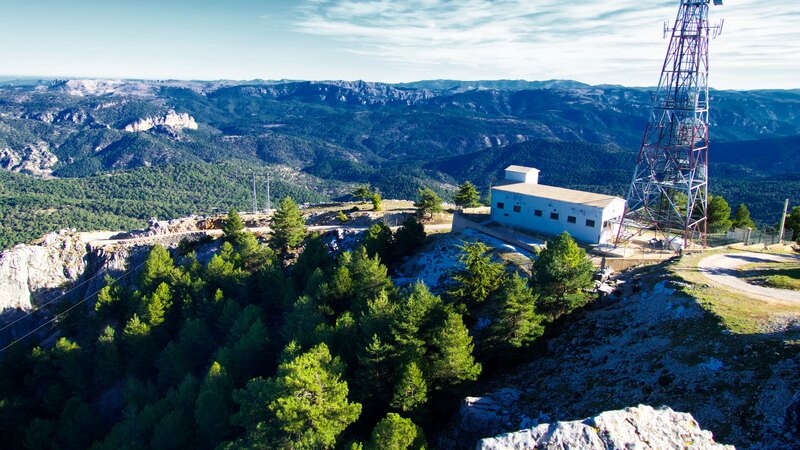 The last few tight and steep turns lift you to the small clump of communication buildings and ariels that are de rigueur for any self respecting peak in Spain. The asphalt peters out to a small flat zone, with stunning 360deg views across Andalucia, Castilla-La-Mancha and Murcia.